USES: This drug is used with other HIV medications to help control HIV infection. It helps to decrease the amount of HIV in your body so your immune system can work better. This lowers your chance of getting HIV complications (such as new infections, cancer) and improves your quality of life. 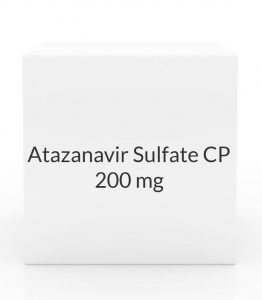 Atazanavir belongs to a class of drugs known as protease inhibitors. It may be given with certain other medications (such as cobicistat, ritonavir) to increase (\"boost\") the levels of atazanavir. This helps atazanavir work better. Atazanavir is not a cure for HIV infection. To decrease your risk of spreading HIV disease to others, do all of the following: (1) continue to take all HIV medications exactly as prescribed by your doctor, (2) always use an effective barrier method (latex or polyurethane condoms/dental dams) during all sexual activity, and (3) do not share personal items (such as needles/syringes, toothbrushes, and razors) that may have contacted blood or other body fluids. Consult your doctor or pharmacist for more details. OTHER USES: This section contains uses of this drug that are not listed in the approved professional labeling for the drug but that may be prescribed by your health care professional. Use this drug for a condition that is listed in this section only if it has been so prescribed by your health care professional. This product may also be used to lessen the risk of HIV infection after contact with the virus (for example, due to a needle stick). Ask your doctor for more details. HOW TO USE: Read the Patient Information Leaflet if available from your pharmacist before you start taking atazanavir and each time you get a refill. If you have any questions, ask your doctor or pharmacist. Take this medication by mouth as directed by your doctor, usually once daily with food. Do not open, crush, or chew the capsules. Swallow the capsules whole. If you are taking atazanavir with certain other medications (such as cobicistat, ritonavir), take them at the same time. The dosage is based on your medical condition, response to treatment, and other medications you may be taking. For children, the dosage is also based on weight. Be sure to tell your doctor and pharmacist about all the products you use (including prescription drugs, nonprescription drugs, and herbal products). If you are directed to take ritonavir with this medication, take them both at the same time. If you are taking antacids or buffered forms of drugs (such as didanosine solution, didanosine enteric-coated capsules), take atazanavir at least 2 hours before or 1 hour after these medications. This medication works best when the amount of drug in your body is kept at a constant level. Therefore, take this drug at evenly spaced intervals. To help you remember, take it at the same time each day. It is very important to continue taking this medication (and other HIV medications) exactly as prescribed by your doctor. Do not skip any doses. Do not take more or less of this drug than prescribed or stop taking it (or other HIV medicines) even for a short time unless directed to do so by your doctor. Doing so may cause the amount of virus to increase, make the infection more difficult to treat (resistant), or worsen side effects. SIDE EFFECTS: Headache or nausea may occur. If either of these effects persists or worsens, tell your doctor or pharmacist promptly. Remember that your doctor has prescribed this medication because he or she has judged that the benefit to you is greater than the risk of side effects. Many people using this medication do not have serious side effects. As your immune system gets stronger, it can begin to fight off infections you already had, possibly causing disease symptoms to come back. You could also have symptoms if your immune system becomes overactive. This reaction may happen at any time (soon after starting HIV treatment or many months later). Get medical help right away if you have any serious symptoms, including: unexplained weight loss, severe tiredness, muscle aches/weakness that doesn\'t go away, headaches that are severe or don\'t go away, joint pain, numbness/tingling of the hands/feet/arms/legs, vision changes, signs of infection (such as fever, chills, swollen lymph nodes, trouble breathing, cough, non-healing skin sores), signs of an overactive thyroid (such as irritability, nervousness, heat intolerance, fast/pounding/irregular heartbeat, bulging eyes, unusual growth in the neck/thyroid known as a goiter), signs of a certain nerve problem known as Guillain-Barre syndrome (such as trouble breathing/swallowing/moving your eyes, drooping face, paralysis, trouble speaking). Tell your doctor right away if you have any serious side effects, including: yellowing eyes/skin, increased thirst/urination, dizziness, lightheadedness, signs of kidney problems (such as pain in side/back/abdomen, painful urination, blood in the urine, change in the amount of urine). Changes in body fat may occur while you are taking this medication (such as increased fat in the upper back and stomach areas, decreased fat in the arms and legs). The cause and long-term effects of these changes are unknown. Discuss the risks and benefits of treatment with your doctor, as well as the possible use of exercise to reduce this side effect. Get medical help right away if you have any very serious side effects, including: signs of a heart attack (such as chest/jaw/left arm pain, shortness of breath, unusual sweating). Atazanavir can commonly cause a rash that is usually not serious. However, you may not be able to tell it apart from a rare rash that could be a sign of a severe reaction. Therefore, get medical help right away if you develop any rash. A very serious allergic reaction to this drug is rare. However, get medical help right away if you notice any symptoms of a serious allergic reaction, including: rash, itching/swelling (especially of the face/tongue/throat), severe dizziness, trouble breathing. This is not a complete list of possible side effects. If you notice other effects not listed above, contact your doctor or pharmacist. In the US - Call your doctor for medical advice about side effects. You may report side effects to FDA at 1-800-FDA-1088 or at www.fda.gov/medwatch. In Canada - Call your doctor for medical advice about side effects. You may report side effects to Health Canada at 1-866-234-2345. PRECAUTIONS: Before taking atazanavir, tell your doctor or pharmacist if you are allergic to it; or if you have any other allergies. This product may contain inactive ingredients, which can cause allergic reactions or other problems. Talk to your pharmacist for more details. Before using this medication, tell your doctor or pharmacist your medical history, especially of: liver problems (including hepatitis B or C infections), kidney problems (including kidney stones), heart problems (such as heart rhythm problems, irregular heartbeat, coronary artery disease, heart attack), diabetes, a certain bleeding problem (hemophilia). Atazanavir may increase the level of cholesterol and fats (triglycerides) in your blood. HIV infection can also cause this effect. This could increase your risk for heart problems such as a heart attack. Discuss the risks and benefits of treatment with your doctor and ways to lower your risk of heart disease. Tell your doctor if you have heart problems, if you smoke, or if you have other conditions that increase your risk of heart disease such as high blood pressure, diabetes, or high cholesterol/triglyceride levels. Before having surgery, tell your doctors or dentist about all the products you use (including prescription drugs, nonprescription drugs, and herbal products). Atazanavir should not be given to children younger than 3 months because of the risk of very serious side effects. Tell your doctor if you are pregnant before using this medication. Treatment can lower the risk of passing HIV infection to your baby. Discuss the risks and benefits with your doctor. This medication passes into breast milk. Because breast milk can transmit HIV, do not breast-feed. DRUG INTERACTIONS: See also How to Use section. Drug interactions may change how your medications work or increase your risk for serious side effects. This document does not contain all possible drug interactions. Keep a list of all the products you use (including prescription/nonprescription drugs and herbal products) and share it with your doctor and pharmacist. Do not start, stop, or change the dosage of any medicines without your doctor\'s approval. Some products that may interact with this drug include: certain medications used to treat chronic hepatitis C (such as boceprevir, simeprevir, elbasvir/grazoprevir), a certain combination HIV medication (elvitegravir/cobicistat/emtricitabine/tenofovir), indinavir, nevirapine, orlistat. Other medications can affect the removal of atazanavir from your body, which may affect how atazanavir works. Examples include bosentan, efavirenz, etravirine, certain rifamycins (such as rifampin, rifapentine), certain drugs used to treat seizures (such as carbamazepine, phenobarbital, phenytoin, primidone), St. John\'s wort, among others. Atazanavir can slow down the removal of other medications from your body, which may affect how they work. Examples of affected drugs include certain alpha blockers (such as alfuzosin, silodosin), certain benzodiazepines (midazolam, triazolam), dronedarone, ergot alkaloids (such as dihydroergotamine, ergotamine), irinotecan, lurasidone, pimozide, a certain drug to treat erectile dysfunction-ED or pulmonary hypertension (sildenafil), certain \"statin\" cholesterol drugs (lovastatin, simvastatin), salmeterol, among others. Prescription and nonprescription drugs to treat heartburn, indigestion, or ulcers (including H2 blockers such as famotidine, proton pump inhibitors such as lansoprazole/omeprazole) reduce stomach acid and decrease the absorption of atazanavir. This may prevent atazanavir from working well. Ask your doctor or pharmacist how to use these medications safely. This medication may decrease the effectiveness of hormonal birth control such as pills, patch, or ring. This could cause pregnancy. Talk to your doctor about additional or alternative reliable forms of birth control, and always use an effective barrier method (latex or polyurethane condoms/dental dams) during all sexual activity to decrease the risk of spreading HIV to others. Tell your doctor if you have any new spotting or breakthrough bleeding, because these may be signs that your hormonal birth control is not working well. OVERDOSE: If someone has overdosed and has serious symptoms such as passing out or trouble breathing, call 911. Otherwise, call a poison control center right away. US residents can call their local poison control center at 1-800-222-1222. Canada residents can call a provincial poison control center. Symptoms of overdose may include: severe dizziness, lightheadedness. NOTES: Do not share this medication with others. Laboratory and/or medical tests (such as viral load, T-cell counts, kidney and liver tests, cholesterol/triglyceride levels, blood sugar levels) should be performed periodically to monitor your progress or check for side effects. Consult your doctor for more details. Information last revised October 2017. Copyright(c) 2017 First Databank, Inc.